Because of concerns that there may be a conflict of interest when a physician refers a patient to a health care facility in which the physician has a financial interest, New York State passed a law. The law prohibits physicians, with certain exceptions, from referring patients to a facility in which the physician or any of his/her immediate family members have a financial interest. The referral can be made under one condition: the physician must disclose this financial interest to patients and advise them of alternative places where they may go to obtain these services. The Medicare program also requires an ambulatory surgery center to disclose physician ownership of and financial interests in the facility. These disclosures are intended to help patients make a fully informed decision about their health care. 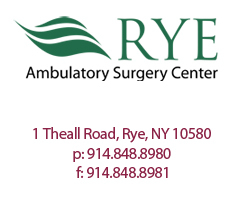 Rye Ambulatory Surgery Center is owned by physicians. The physician who referred you to the Center or who will be performing your surgery or other services in connection with your surgical procedure may be an owner of the Center. Please discuss this matter with your physician so that you may exercise your right to be treated in another health care facility if desired. Upon your request, your physician will provide names and addresses of alternative providers where you may go to obtain services.